Day 27 was started 10 degrees warmer than yesterday at 44 degrees. I checked with knucklehead to see if he was on board with the route. The dashboard of the GPS looked completely different. The words were in some other language. It took me a while to figure out where to change it back to English. The voice had changed to another language as well. Knucklehead was calculating the route as if I was not taking roads but traveling over ground directly to the next way point. I thought I had it all straightened out until I arrived in Silver City. The breeze was light and mostly on my tail. 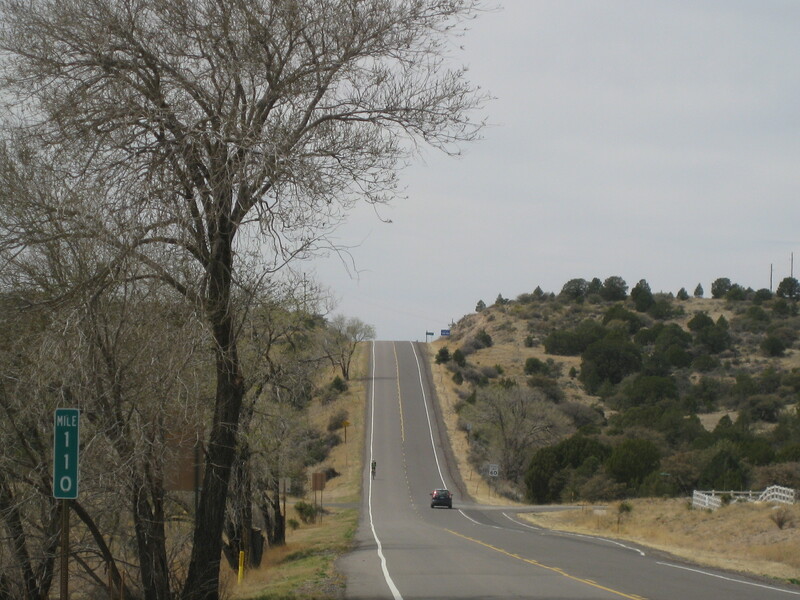 I continued on Route 180 on relatively flat road, then I started to climb gradually. Then the climbing increased but the climbs were never as steep or as long as the climbing two days ago. Little by little I kept stair stepping my way up up up. Then the sign I had been looking for appeared. Now one would think If you cross the divide it should be all down hill from here, but in a day or so I will have another significant climb up to 8000 feet. Apparently the water isn’t too swift around these parts if it has to make over the next pass. It seems to me that pass ought to be the divide. Maybe I should follow the water. I arrived in Silver City, my crew went in search of propane and I continued to pedal through town. Then Knucklehead and I got lost. It took us over 20 minutes to find our way back on course. We were both blaming each other for the mishap. Stats for day 27: Rode 32.73 miles at 9.6 mph (mostly in the right direction), Max=14.4 mph, Ave heart rate=112, Max heart rate=140, Ascent=2454′, Descent=899′, Max elevation=6245′, Min elevation=4449′, Ave temp=69 degrees. Calories burned=1194. Total trip miles 690 to date. 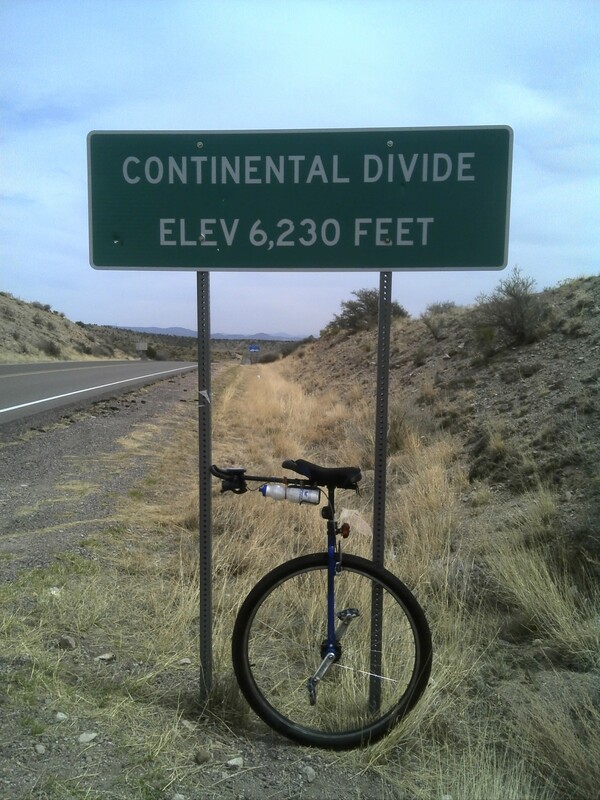 This entry was posted in Uncategorized, Unicycle Across the Country and tagged Cycle, New Mexico, tour. Bookmark the permalink. Maybe the lack of oxygen at those high altitudes is making Knucklehead a little delirious. Sorry, I missed something. Which one of you is Knucklehead? My GPS most of the time. Sometimes I’m the knucklehead. This is great fun to read, and brings a lot of vicarious enjoyment for my husband. We’re rooting for you!